Cedar House is now the only survivor of an estate which once bordered a long section of Horton Road and ran northwards through to our London Road. The ownership of this house can be traced back to the mid 1500s, although altered in the 1700s and 1800s, while the first evidence for Leigh House is from around 1700, and Satis House was built in 1806 on the site of an older farm. Both Leigh and Satis were demolished in the 20th century. The history of this area is very complicated indeed and has been abbreviated here. It is characteristic of how this area developed from around 1800 that the original muddled plots of land and dwellings were amalgamated to create garden grounds around a few large high-status houses. This involved the demolition of many early houses and cottages, including two significant farmyards. This process began to be reversed in the twentieth century, when the oversized houses became no longer viable, unless converted to flats, and the land around them was sold for housing development. 1) Leigh House is now only represented by the small estate of houses in Leigh Park but it was once a big house with grounds extending from the Astracot cottages in Horton Road eastwards to the present Link Road, and northwards through to London Road. 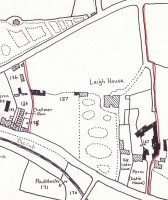 The earlier Canister House was on roughly the same site, but when Leigh was built to replace it in the 1820s the grounds were extended by the demolition of two other big houses and a farmyard on its west. 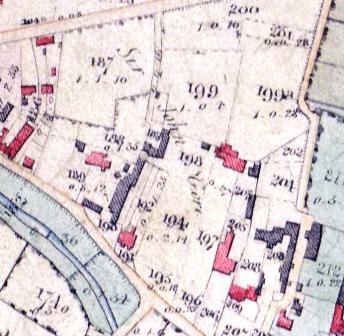 These are seen in the Enclosure map surveyed in 1810 (plots 188 to 192) but demolished before the 1839 rate map was drawn, and by 1899 the grounds had been laid out with paths, lodges and hothouses. By 1899 an entrance drive had been developed from an old lane leading from London Road, which still exists opposite the mini roundabout in London Road but now only leads to the surviving Leigh House Lodge, much altered. The modern Leigh Park lane leading from London Road follows the other sweep of the drive and the site of the other lodge. There are no photos of Leigh House (unless you know of one?) but in 1920 it was described in an auction sale advert, see below. 3) Satis House (to east of Cedar), demolished in the 1970s, was built in the early 1800s as a farm house. It was not the one occupied by the Herschels as has often been said locally; they actually lived in part of the Lawns complex. The name is modern, presumably referring to Miss Haversham’s house in Charles Dickens’s Great Expectations, but it does not resemble either of the real buildings on which Dickens based his fictional house. A block of flats now occupies its site. 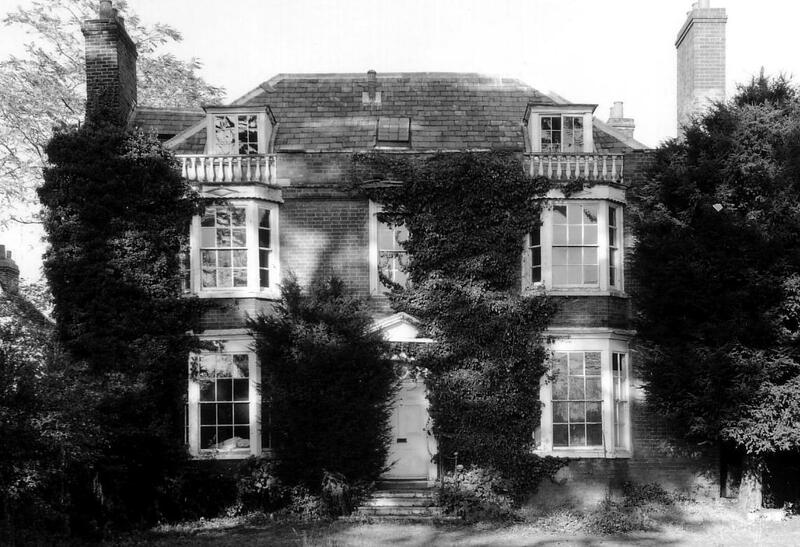 The last owners of this house before its demolition were the Lady Susan Caroline Cholmondeley and her daughters, the Ladies Marcia, Mabel and Eva. Lady Susan was the widow of Charles George Cholmondeley, Viscount Malpas, who had died in 1869 before the ladies of the family settled here. At the 1891 census the household included twelve servants, both male and female. 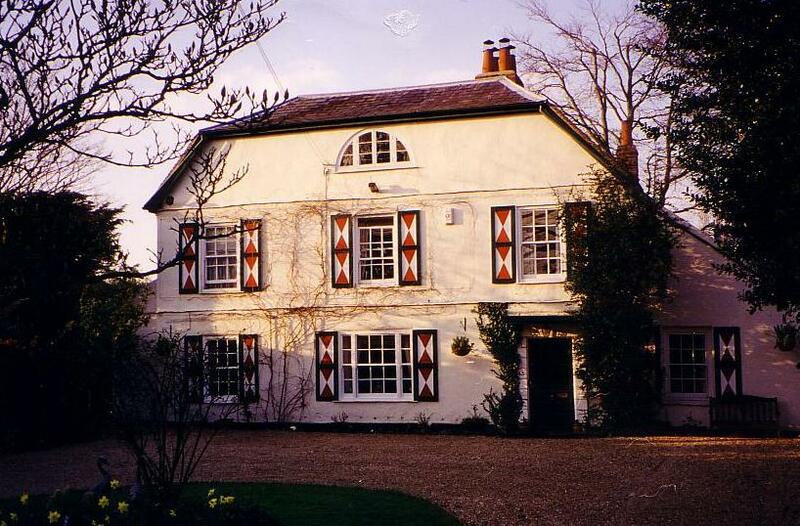 Lady Marcia and Lady Eva married two brothers, Percy John de Paravicini and Henry Farquhar de Paravicini, sons of Baron James Prior de Paravicini who had been settled at Riverside House in Datchet for some years. Their mother Lady Susan was buried in Datchet churchyard in 1893 while Eva died in 1954 and Mabel (who never married and was remembered as ‘poor Lady Mabel’ and as being a ‘hunchback’), died in Windsor in 1944 aged 80 . 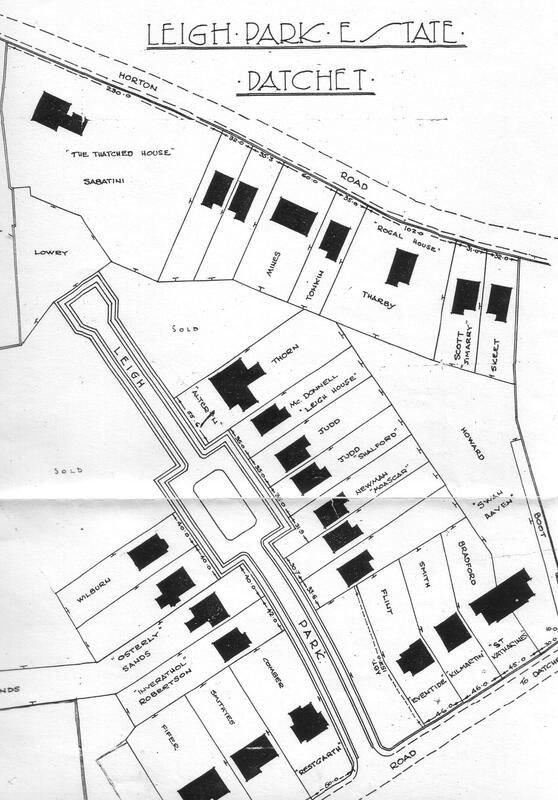 It was Mabel who is said to have stipulated that the plot where her numerous cats had been buried should kept free of the houses about to be built, and it is tempting to think that the island of shrubs in the present Leigh Park road might mark the site of this cemetery. Preceding the Cholmondeleys was Rev. Henry Francis Udney Hall, who was the vicar of Datchet at the time the church was rebuilt and paid for a good deal of that work himself as well as a magnificent new vicarage which was built while he lived at Leigh House. He was a man of exceptional wealth for a vicar, as he seems to have bought Leigh House from Earl Grey’s heirs, but nothing more is known about him. He and his family are buried in the churchyard. 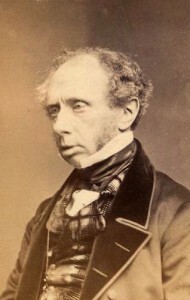 Henry Lord Howick, 3rd Earl Grey bought Leigh House in 1839. He was the son of Charles Earl Grey (who, as Prime Minister from 1830, was responsible for the bill abolishing slavery and for seeing the Reform Act, the Factory Act and the Poor Law through Parliament). Henry was also an active Whig politician and for a time in the 1840s was Colonial Secretary. He retired to the family seat at Howick in Northumberland in middle age though retaining ownership of Leigh House and leasing it to Sir Henry Mildmay, who was a member of the London social set at the time but does not appear to be related to Earl Grey. Lady Susan Cholmondeley was in correspondence with Lord Howick’s wife, Maria, 3rd Countess Grey while the latter lived at Leigh House; a friendship which may provide a link for the Cholmondeleys eventual residence there. The capital freehold mansion with its beautiful grounds, late the residence of Admiral Sir John Gore, deceased. 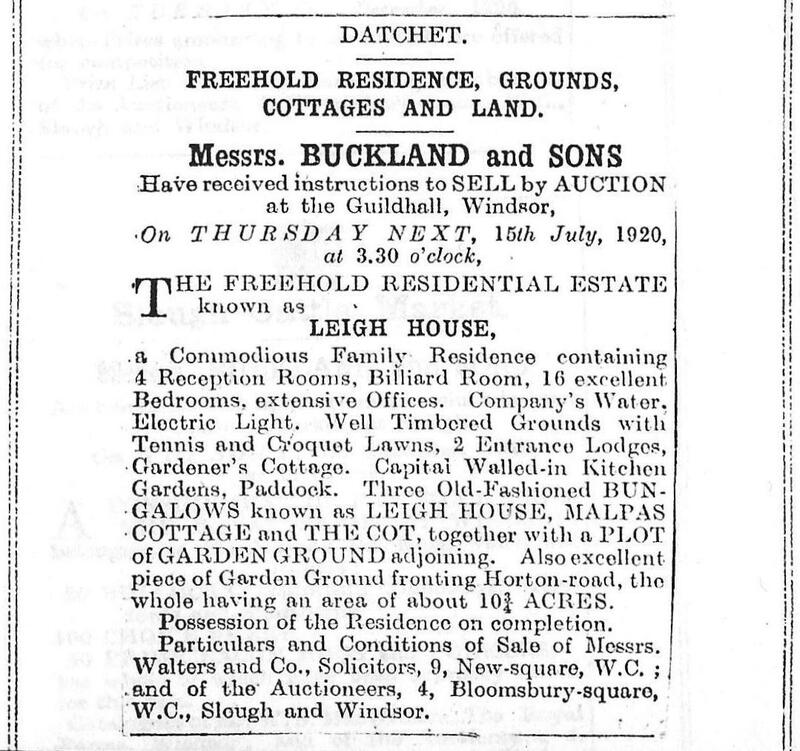 occupation; a particularly desirable residence for any family connected with the Court or having sons at Eton. We are as you suppose in our new villa and you cannot think how pleased we are with it. I am sure it has been an immense bargain and it will when furnished be very nice indeed. At present we look a little bare being without window curtains and many other most essential (items) of furniture, but you will not be surprised at this when I tell you we were put into possession of the house almost totally stripped of every earthly thing last Wednesday and got into it the next day. 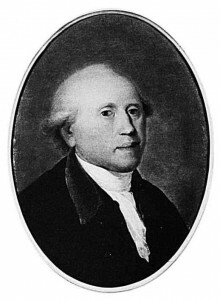 Before Earl Grey the owner of Leigh House was Vice-Admiral Sir John Gore who bought the previous Canister House from the Earley family in about 1825. He not only rebuilt the house but also bought the old Carter’s Farm on its west and two other houses belonging to the Earley family, all of which were then demolished; thus opening up of the estate towards the west and north. At this time ships still seized treasure from enemies and John Gore became fabulously wealthy from the capture of Spanish frigates during the French Revolutionary and Napoleonic Wars. In 1835 Vice-Admiral Gore’s son, Lieutenant John Gore, died while trying to rescue a man overboard in the East Indies; the ship was one of his father’s fleet and ten men were lost altogether in the incident. Admiral Gore himself died a year later, his death hastened by shock and grief, and the family left Datchet. A memorial to the family is in Datchet parish church. 1622: Robert Style, house and land called Pomfretts, previously Thomas Denby’s, 37 acres, annual valur 12 sh. 1548: Thomas Denby, land previously Pomfrett’s, 12 sh. A substantial brick built dwelling house, occupied as a Ladies’ Boarding School at Datchet, containing 10 airy sleeping rooms, 2 parlours, large double hall, kitchen, wash house, laundry and other offices, with 2 substantial brick-built detached schoolrooms, large garden, let on lease to Misses Young & Hunt, of which 12 years are unexpired. The Misses Young and Hunt were followed as tenants by Jane Sharman in the 1830s; at its peak in 1841 there were 23 boarders and Cedar House only ceased to be a school in about 1880. One of Ralph’s unmarried daughters, Mary Goodwin, was the owner by 1860, but she continued to lease the house as a school. This shoe was found in the attic of Cedar House during roof repairs in the late 1980s when the house was owned by Egbert Blank. It was assessed by the V&A Museum’s Textile Department and in 1998 was presented to the Royal Borough Collection. The V&A provided the following information: The remains of this shoe date from 1825-30 and belonged to a young lady, custom-made with identifying initials AB. It is in the ‘straight’ tradition, i.e. each shoe straight and square-toed with no right or left styling, which was not introduced until around 1850. 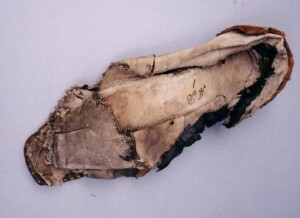 Much of the shoe has rotted away but the heel was made of quite strong leather and the main part of the shoe possibly of soft kid but also with fabric. There has been a very long tradition of superstitiously placing shoes in rafters, thresholds, or chimneys to ward off evil spirits. 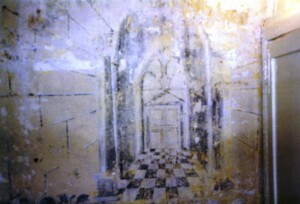 Towards the back of the house, on a wall beside a door, there is a small area painted in black, grey and white to suggest an architectural perspective . The listed building description dates it to the late 1700s, perhaps to the time when the house was occupied as a school, which first appears in the records in 1810. Nothing more is known about this intriguing little piece of amateur wall painting. The house also contains a small closet on a landing which is thought to have been used for powdering fashionable wigs in the same period – literally a ‘powder room’. Ralph Goodwin bought Cedar House from the Earley family. Its previous owner was Thomas Dell, a substantial as well as leaseholders of the valuable Rectory and Eton College farmland in Datchet; three generations of them were buried in a chest tomb in the churchyard. 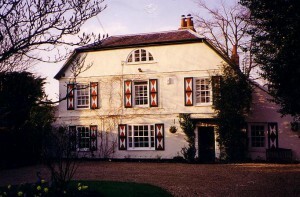 The house was bought by Thomas’ father John Dell in about 1730 from John Bentley. He had inherited it from William Berrington, whose family had owned it since at least 1622. 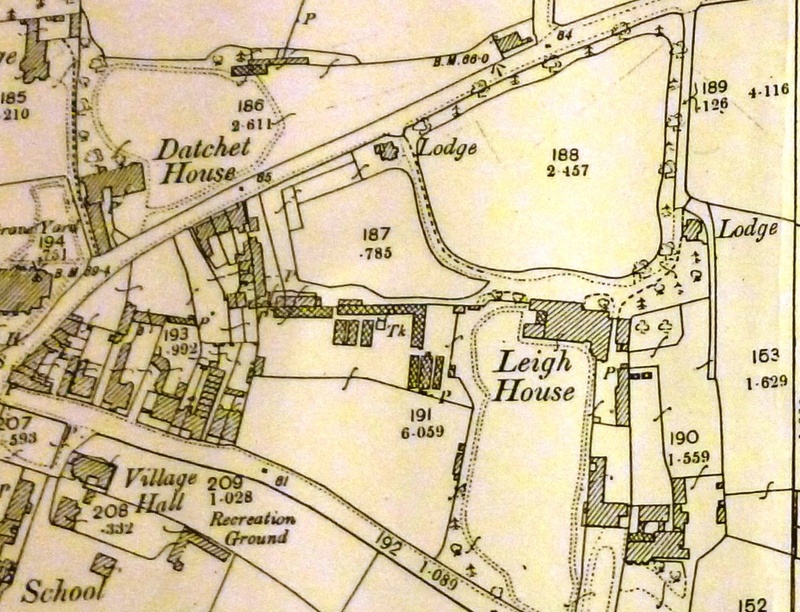 In that year a survey of the Manor of Datchet listed Thomas and Elizabeth Berrington in possession of a house adjacent to Datchet Moore (ie to the Common) which can be identified with the present Cedars. 1548 John Howell is owner of a property formerly belonging to Appleton. … to my wife Ann for life, all the messuage (legal term for house), tenement and garden lately new built laid out in Datchet, lately in the occupation of William Sturges and now unoccupied and under repair, and after her decease to my nephew Ralph Goodwin and his heirs. However, John’s wife actually died before he did and a codicil of 1815 states that the house was then in John’s own occupation but already owned by his nephew Ralph. After Ralph’s death in 1823 it was inherited by his widow, also named Ann (nee Taylor) and then to her heirs and trustees, Taylor & Simpson who continued to own it through to the late 1800s. It was a high-status house throughout the century, occupied by Philip Oliphant Kington who was a merchant trading in Swedish goods, then by Stephen Goodheart, also a merchant, and by 1890 the independently wealthy Alfred T Olive. Many people will recall Mrs Marion Cox, an antique dealer who lived here for many years until the 1970s. She was the last resident in the house to which she probably gave the name Satis. Much interest was focused on this house when it was about to be demolished in the 1970s. However, it was not as old as it was then claimed to be, and cannot have been the dilapidated old house described by Caroline Herschel where she and William lived in 1783, as local legend had asserted. 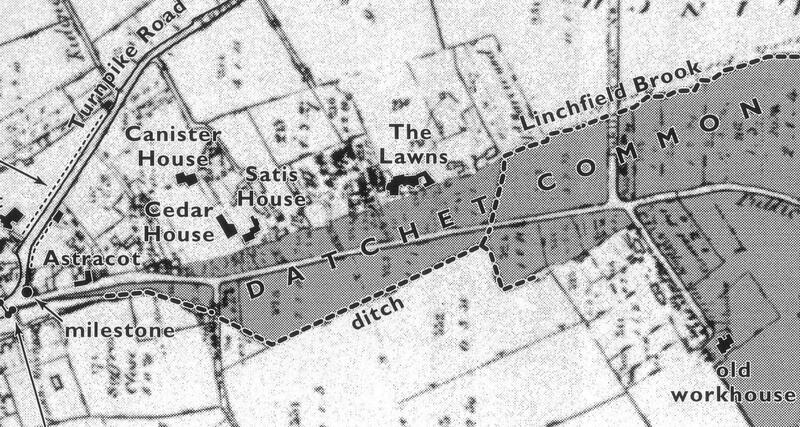 To understand this whole area it is necessary to look at the old situation of Datchet Common which was to the east of the village but began as a funnel shape from the centre of Datchet and bordered both sides of our present Horton Road. 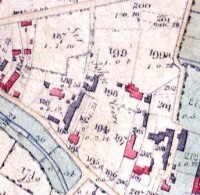 Its original position (from at least 1500) has been ascertained from information in the Parish Enclosure Award of 1834 (map surveyed c1810) when common land and open fields were redistributed to private owners and enclosed by new fences. The original plots of common land as mapped and described in the Award have been reconstructed and highlighted in this map. 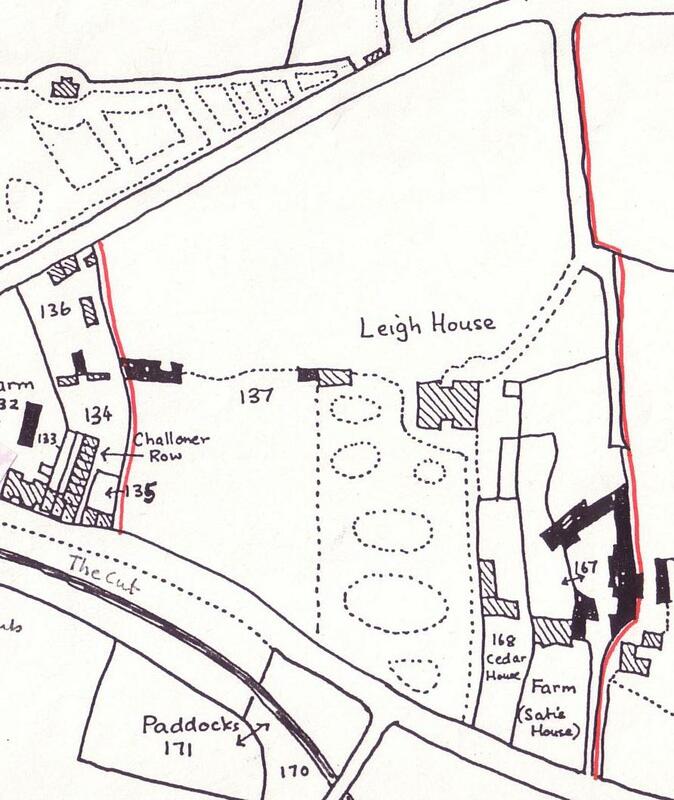 This map suggests that the early line of the Linchfield Brook was a continuation of its natural line along the common (as at top right of the map), because all the original property boundaries front the old edge of the common rather than the modern road. Development along the fringe of a common is typical of medieval ‘squatting’, the establishment of ownership piecemeal in a sort of no-mans-land which later became official under the authority of the manor. It is very likely that the Horton Road houses originated in this way. From around 1700 the owners of properties along the northern edge of the common (as in the map) were recorded as having dug huge trenches on the common and failed to fill them in when required to do so, described in 1730 as being ‘100 yards long, seven feet wide and five feet deep’. A ditch on this scale must have become part of the landscape, and this researcher’s suggestion is that the Linchfield Brook was being deliberately shifted away from its original course close to the houses on its margin to run in a line further south, which is still present as the watercourse across the recreation ground. This would then have provided a strip of dryer land, though still designated as part of the common, in front of each property. At Enclosure each of these properties were given private ownership of their own strips down to Horton Road, which is why they still have long frontages to the road. Land ownership along this strip is more complicated than anywhere else in the village, probably due to the haphazard way it was originally settled in small lots. 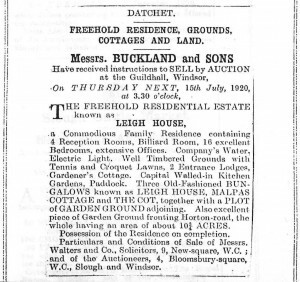 Documentation is also difficult because some plots became freehold very early while others remained as copyhold from the Manor of Datchet until the 20th century. All were completely intermixed so that many different sorts of legal deeds and titles survive – or do not. Almost all the original dwellings were swept away during the mid-1800s but the area has now been largely built up again with 20th century infill developments occupying the garden grounds created around the former big houses.